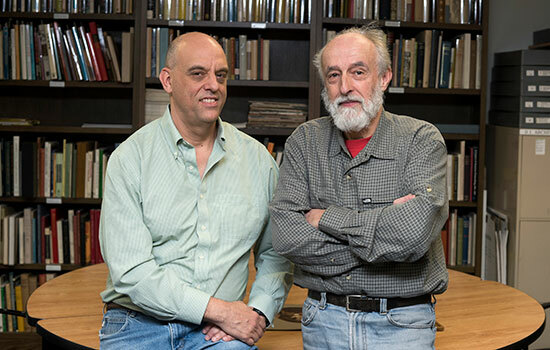 Daniel Burge, left, and Jean-Louis Bigourdan, two senior research scientists at RITâ€™s Image Permanence Institute, are leading major education and research projects that have received grants totaling more than $544,000 from the National Endowment for the Humanities. Rochester Institute of Technology’s Image Permanence Institute has received $544,198 in grants from the Division of Preservation and Access at the National Endowment for the Humanities (NEH) to support two major education and research initiatives. An education and training grant of $195,049 will fund a two-year project for workshops in libraries, archives and museums throughout the United States on the identification and long-term care of digitally printed materials. The project, titled Digital Print Preservation: Education and Training for Cultural Heritage Professionals, leverages more than a decade of research and education initiatives at IPI focused on digital print preservation. The research’s results in this area are accessible through the institute’s Digital Print Preservation Portal (DP3). Workshops are scheduled to begin in July and continue through December of next year. A research and development grant of $349,149 will support IPI’s three-year project focused on understanding the complex interactions between hygroscopic collection materials—defined as those materials that have a propensity to absorb moisture from the air—and their environment in response to temperature changes. The project, titled The Impact of Temperature Transitions, Short-term and Seasonal, on the Moisture Content of Library and Archive Collections, builds upon a legacy of IPI laboratory research and field experiments and will inform strategies for minimizing moisture content driven deterioration processes in both storage and access scenarios. An IPI survey of cultural heritage institutions revealed significant concern about how to care for the growing number of digitally printed materials in their collections. The survey also showed that most institutions have experienced some degree of objectionable deterioration, including fading, yellowing and water damage, to their collections. Through a series of research and development projects over the past decade, IPI has established a set of science-based, best practices for the safe storage, display, handling and housing of these materials as well as strategies to prepare for, respond to, and recover from destructive water emergencies, including floods. The primary goal of the two-year education and training project, led by Senior Research Scientist Daniel Burge, is to reach institutions that have not had the chance to learn this information and develop the requisite skills needed to care for their digitally printed documents, photographs, artworks, books and periodicals. This three-year IPI project led by Senior Research Scientist Jean-Louis Bigourdan involves new laboratory experiments based on previous research and relies on an expert multidisciplinary project team that will collaborate on data interpretation and dissemination. The project’s results have the potential to inform new sustainable preservation and access strategies for both large and small humanities research collections. Laboratory experiments will provide better understanding of temperature’s role in determining object moisture content by measuring and quantifying temperature effects in simulated, real-world scenarios of short-term and seasonal time frames for varying collection configurations. The goal is to provide a better understanding of how controlled temperature changes can be used to influence moisture content in library and archive collection materials and will be of critical use to archivists, collection managers, conservators, facilities administrators, librarians and preservation researchers. To demonstrate the competitiveness of these latest NEH grants, Burge’s education and training project was one of only seven grants funded in the category nationwide, while Bigourdan’s was among only five research and development grants to receive funding. The Image Permanence Institute, part of RIT’s College of Imaging Arts and Sciences, is a recognized world leader in the development and deployment of sustainable practices for the preservation of cultural heritage collections. The institute accomplishes this through a balanced program of research, education, products and services that meet the needs of individuals, companies and institutions. Created in 1965 as an independent federal agency, the National Endowment for the Humanities (NEH) supports research and learning in history, literature, philosophy and other areas of the humanities by funding selected, peer-reviewed proposals from around the nation. Additional information about the NEH and its grant programs is available at www.neh.gov.